Guitar Hero 5 is a rhythm video game and the fifth main entry in the Guitar Hero series. Similar to the preceding title, Guitar Hero World Tour, Guitar Hero 5 is geared towards playing in a four-person band experience, including lead and bass guitar, drums, and vocals. The game is available as a standalone title, allowing players to use existing compatible instrument controllers, and as a bundle that provides these controllers. 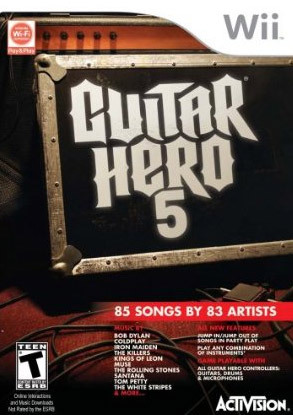 Guitar Hero 5 adds several new features, such as drop-in/drop-out play, bands composed of any combination of available instruments, a Rockfest competitive mode consisting of several various scoring mechanisms, and both song-specific and general Challenges to unlock new avatars, clothing, and other extras in the game. Many of these changes were added to make the game a more social experience, allowing players across a range of skill levels to be able to play cooperatively and competitively against each other both locally and online. Play Roadie Battle with your Nintendo DS - connect one or two DS systems to your Wii to play as a ‘roadie.’ Sabotage your opponents’ equipment and fix your own band’s gear to save the show. The graph below charts the compatibility with Guitar Hero 5 since Dolphin's 2.0 release, listing revisions only where a compatibility change occurred.